The health care debate has been raging for years, and it is at a peak right now as a Republican Congress and President seek to repeal and possibly replace the Affordable Care Act. Much rhetoric has been expended on both sides, and much of it is confusing. What is clear is that the general populace, while not thrilled about the ACA prefers it to the current alternatives. One of the "groups" that is caught up in the debate is those persons with disabilities, many of whom are covered by Medicaid, and who could face loss of coverage under current proposals. 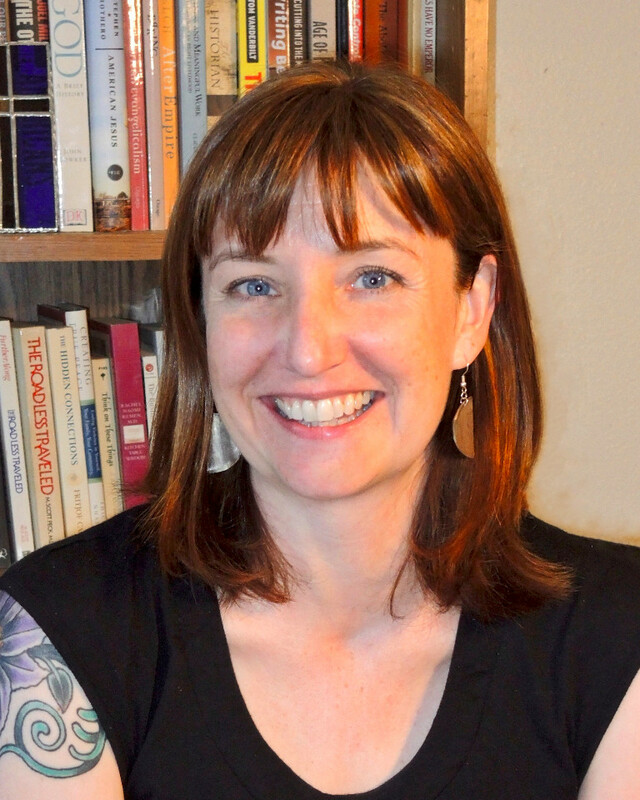 Courtney Wilder raises questions from the perspective of "Disability Theology." That is, viewing theology from the perspective of those with disabilities. As the pastor of a young man with Down's syndrome, I know how the debate affects his family. I invite you to read this essay and contemplate how people of faith ought to view the debate, recognizing that one can equate living a good life with being illness or disability free. This isn't just a political discussion, this is a spiritual one! Amidst many developing political news stories this summer, one of the most important in terms of policy is Congress’s ongoing attempt to reform healthcare and health insurance access in the United States. Disability rights activists have been vigilant in protesting the proposed changes, and characterizations of people with disabilities by lawmakers have taken on religious overtones. The field of disability theology provides much-needed resources for analyzing and rejecting religious denigration of people with disabilities. An often-repeated goal of Republicans in Congress is to “repeal and replace” the Affordable Care Act passed in 2010. The House of Representatives passed its version of a healthcare reform bill on May 4, 2017; the Senate vote on its own version is expected to take place in July. Both bills would, according to the Congressional Budget Office, significantly increase the number of uninsured Americans while drastically cutting funding for Medicaid. Medicaid coverage is crucial particularly for many people with disabilities: the Kaiser Family Foundation reports that Medicaid offers insurance coverage for 35% of Americans with disabilities, many of whom have significant healthcare needs. Another key issue is the proposed resumption of lifetime caps on healthcare benefits. For many people with disabilities, particularly children with acute health conditions, these caps would prevent them from accessing care necessary for survival. One striking feature of the conversation around this proposed legislation is the argument that people who are most in need of access to healthcare—including both people with disabilities and people with preexisting conditions—are morally at fault for their illness or their disability. The most explicit instance of this is the claim made in early May by Alabama Representative Mo Brooks, who said “people who lead good lives, they're healthy, they've done the things to keep their bodies healthy,” suggesting that such people are entitled to lower insurance costs than people he would presumably deem “unhealthy” and regard as not having led good lives. Although Brooks walked back that claim, he was later echoed by Wisconsin Senator Ron Johnson. On June 25, 2017, Johnson argued on Meet the Press that health insurance companies should not be required to provide insurance to those with preexisting conditions, since auto insurance companies can exclude “somebody after they crash their car.” Again, this rhetoric, comparing people with disabilities to damaged automobiles, explicitly dehumanizes and places moral blame on people who need healthcare the most as a strategy to justify removing their access to it. Responses to this legislation by disability rights activists have been fierce. The work of ADAPT (American Disabled for Attendant Programs Today) is one example. 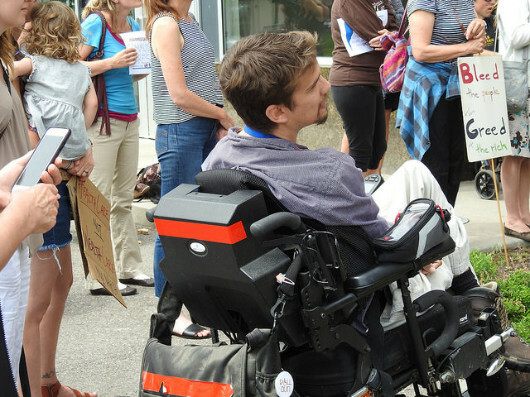 The group describes itself as “a national grass-roots community that organizes disability rights activists to engage in nonviolent direct action, including civil disobedience, to assure the civil and human rights of people with disabilities to live in freedom.” ADAPT began in Denver in the 1970s and originally focused on access to public transportation for people with disabilities; since then it has advocated for the rights of people with disabilities more broadly, particularly the right to live independently. In late June 2017, ADAPT protesters, many with visible disabilities and many using wheelchairs, were arrested for staging sit-ins to protest proposed cuts to Medicaid. Protests blossomed across the country, including in the offices of members of Congress. ADAPT was focused on Senate Majority Leader Mitch McConnell, but other Republicans in Congress also had ADAPT protestors arrested for occupying their offices, including Senator Tom Cotton of Arkansas and Colorado Senator Cory Gardner. Social media coverage of these events—including images of some wheelchair users being forcibly removed from their wheelchairs and carried off by police, and pictures of others having their hands cuffed behind them in their wheelchairs—has been significant. The Twitter hashtag #ADAPTandRESIST was popular for tagging images of protestors in individual tweets. The Twitter user @ColleenFlangan, for instance, tweeted an image of an activist with her hands zip-tied behind her in her wheelchair with the caption “Medicaid is important to disabled people. We raise our voice and get answered with handcuffs #ADAPTandRESIST.” This was retweeted over 10,000 times. Explicit appeals to religious ideals or doctrine to support the rights of people with disabilities were rare within this particular hashtag, however. This raises some questions: What might religious people make of this ongoing clash of values? What tools does Christian theology provide for analyzing and responding to this issue? Theologians of disability powerfully reject the conflation of sin with disability, a perspective that is useful when considering the religious rhetoric around people’s bodies and their healthcare needs in the current political climate. Disability theology is typically identified as a form of liberation theology, offering critiques of social systems that violate the intentions and will of God by oppressing and dehumanizing people with disabilities. Nancy Eiesland, the bold foremother of this discipline, made the argument in her book The Disabled God that Jesus’ resurrected body reveals him to us as the disabled God, still impaired after resurrection and without sin. Particularly relevant to the current healthcare debate is the work that Eiesland and others have done to identify sin in the phenomenon of oppression: what is wrong is the lack of access for people with disabilities to equal education, healthcare, public spaces, and other social systems that support non-disabled people in their independence. The sin is located not in the body of the person with a disability (or a preexisting condition) but in the marginalizing of that person by his or her society. The argument that access to healthcare is a reward for living a moral life presumes that the origin of a disability is within the control of an individual person, rather than being a function of the diversity of human biology or the result of an everyday experience like aging, a car accident, a healthcare diagnosis, a traumatic experience, or the emergence of a mental illness. The rhetoric of politicians like Brooks and Johnson is aptly countered by disability theologians’ critique. These thinkers provide an analysis which suggests that public policy that rewards able-bodied people and punishes people with disabilities by offering healthcare access to the former and withholding it from the latter is deeply sinful, while the work of ADAPT activists better embodies the will of God. - “Congressional Budget Office Cost Estimate: H.R. 1628 American Health Care Act of 2017. As passed by the House of Representatives on May 4, 2017.” Congressional Budget Office. May 24, 2017. - Diaz, Daniella, and Pete Grieve. “Dozens arrested after disability advocates protest at McConnell's office.” CNN. June 22, 2017. - Edwards, David. “Ron Johnson: People with preexisting condition don’t deserve insurance like ‘somebody who crashes their car’.” RawStory. June 25, 2017. - Eiesland, Nancy. The Disabled God: Toward a Liberatory Theology of Disability. Abingdon Press: 1994. - Flanagan, Colleen. “Medicaid is important to disabled people. We raise our voice and get answered with handcuffs #ADAPTandRESIST.” Twitter. June 22, 2017. - Moffitt, Mike. “GOP’er: People who lead good lives don't have pre-existing conditions.” SFGate. May 3, 2017. - Paradise, Julia. “10 Things to Know about Medicaid: Setting the Facts Straight.” The Henry J. Kaiser Family Foundation. June 9, 2017. - Worthington, Danika. “Disabled protesters arrested at Sen. Cory Gardner’s Denver office after 2-day sit-in.” The Denver Post. June 29, 2017. Author, Courtney Wilder, earned her PhD from the University of Chicago and teaches at Midland University in Fremont, Nebraska. Her book Disability, Faith, and the Church: Inclusion and Accommodation in Contemporary Congregations was published by Praeger in 2016.